Background: Long-term non-invasive positive pressure ventilation (NIPPV) might improve the outcomes of pulmonary rehabilitation in patients with chronic obstructive pulmonary disease (COPD) with chronic respiratory failure. A study was undertaken to investigate whether nocturnal NIPPV in addition to pulmonary rehabilitation improves health-related quality of life, functional status and gas exchange compared with pulmonary rehabilitation alone in patients with COPD with chronic hypercapnic respiratory failure. Methods: 72 patients with COPD were randomly assigned to nocturnal NIPPV in addition to rehabilitation (n = 37) or rehabilitation alone (n = 35). Outcome measures were assessed before and after the 3-month intervention period. Results: The Chronic Respiratory Questionnaire total score improved 15.1 points with NIPPV + rehabilitation compared with 8.7 points with rehabilitation alone. The difference of 7.5 points was not significant (p = 0.08). However, compared with rehabilitation alone, the difference in the fatigue domain was greater with NIPPV + rehabilitation (mean difference 3.3 points, p<0.01), as was the improvement in the Maugeri Respiratory Failure questionnaire total score (mean difference −10%, p<0.03) and its cognition domain (mean difference −22%, p<0.01). Furthermore, the addition of NIPPV improved daytime arterial carbon dioxide pressure (mean difference −0.3 kPa; p<0.01) and daily step count (mean difference 1269 steps/day, p<0.01). This was accompanied by an increased daytime minute ventilation (mean difference 1.4 l; p<0.001). Conclusion: Non-invasive ventilation augments the benefits of pulmonary rehabilitation in patients with COPD with chronic hypercapnic respiratory failure as it improves several measures of health-related quality of life, functional status and gas exchange. In patients with severe COPD, pulmonary rehabilitation might be less effective4 as extreme breathlessness limits them in achieving high exercise intensities. Additive therapies such as non-invasive ventilation are therefore needed. Nocturnal non-invasive ventilation might improve the outcomes of rehabilitation by resting the respiratory muscles,5–7 improvement of the internal milieu of the respiratory muscles,8 improved lung mechanics,9 10 improved ventilation during the day11 12 and improved sleep quality.13 Trials of non-invasive ventilation in stable COPD have yielded conflicting results.5 13–19 A recent meta-analysis did not show beneficial effects on daytime blood gases, lung function, respiratory muscle function, exercise tolerance and mortality.20 The studies differed considerably in patient selection, mode and duration of ventilation, ventilatory settings and the degree of assistance and time to adjust to the ventilator. We hypothesise that, compared with pulmonary rehabilitation alone, non-invasive intermittent positive pressure ventilation (NIPPV) in addition to pulmonary rehabilitation would improve health-related quality of life, functional status and gas exchange in patients with severe COPD with chronic hypercapnic respiratory failure. Patients were recruited from hospitals in the northern Netherlands. Inclusion criteria were stable clinical condition (no exacerbation in the 4 weeks prior to study participation together with a pH of >7.35); severe COPD (GOLD stage III or IV22 (forced expiratory volume in 1 s (FEV1)/forced vital capacity (FVC) <70% and FEV1 <50% predicted); hypercapnia at rest (arterial carbon dioxide pressure (Paco2) >6.0 kPa while breathing room air); and age 40–76 years. Exclusion criteria were cardiac diseases limiting exercise tolerance; neuromuscular or restrictive pulmonary diseases; previous exposure to chronic NIPPV or to a pulmonary rehabilitation programme during the previous 18 months; or apnoea/hypopnoea index (AHI) ⩾10/h (see online supplement). After randomisation, patients were maintained on their usual medication for a 12-week run-in period. Thereafter, the patients started a 12-week multidisciplinary rehabilitation programme. The programme consisted of strength training, cycling, walking, inspiratory muscle training, education and psychological and/or nutritional support if necessary. Patients trained three times a week for 1 h and each session was fully supervised. Patients in the PR + NIPPV group were instituted on nocturnal bilevel NIPPV (bilevel positive airway pressure (BiPAP), spontaneous/timed mode (S/T), via nasal or full face mask) in the hospital immediately before starting the rehabilitation programme. Inspiratory airway pressure (IPAP) was increased up to the maximal tolerated pressure titrated towards an optimal correction of nocturnal arterial blood gases (Paco2 <6.0 kPa and arterial oxygen pressure (Pao2) >8.0 kPa). The effectiveness of NIPPV was monitored by means of nocturnal blood gas registrations at baseline before institution of NIPPV, at the end of the in-hospital period and after the rehabilitation programme. During the week before and the week after the rehabilitation programme the following questionnaires and measurements were performed: Chronic Respiratory Questionnaire (CRQ),24 Maugeri Respiratory Failure questionnaire (MRF-28),25 Severe Respiratory Insufficiency questionnaire (SRI),26 the Hospital Anxiety and Depression Scale (HADS),27 the Medical Research Council scale,28 Borg scale,29 arterial blood gases, 6-minute walking test, endurance shuttle walk test, incremental cycle ergometry, daily step count30 and lung function. Details of the rehabilitation programme, institution of NIPPV and measurements used are given in the online supplement. The primary outcome parameter was health-related quality of life as measured by the CRQ. To detect a clinically relevant change in CRQ score of 10 points with 80% power, at least 40 patients per group were needed.31 Considering a probability of 20% drop-out of randomised patients, the target sample size was 50 patients per group. The results are expressed as mean (SD) or median (interquartile range (IQR)). The main outcome parameters were evaluated in terms of patient completers. Outcomes were assessed in terms of changes from baseline (paired t test or Wilcoxon signed rank test for separate groups) and differences in changes from baseline between the two groups corrected for baseline values (linear regression analysis). The Medical Research Council is a categorical scale and therefore changes were compared with a χ2 distribution test to assess differences in changes between groups. Overnight blood gas registration results were assessed by repeated measures ANOVA with post-hoc Bonferoni corrections. SPSS Version 14.0 was used for all analyses. A p value of <0.05 was considered significant. Of the 227 patients invited to participate who met the inclusion criteria between September 2004 and January 2007, 87 agreed to participate. As 15 patients eventually did not satisfy the inclusion criteria, 72 patients were randomised. During the run-in period, six patients randomised to the NIPPV + PR group dropped out (fig 1). The baseline characteristics of the study patients are shown in table 1. Figure 1 Flow diagram of the study progress. NIPPV, non-invasive positive pressure ventilation. In the NIPPV + PR group, seven patients did not complete the study. Five patients could not adapt to the NIPPV (16%), one patient withdrew because of rheumatic complaints and one patient died of progressive respiratory failure due to a COPD exacerbation after 69 days on NIPPV, despite initial blood gas improvements. The completers used the NIPPV on average 96% of the days with a median daily NIPPV use of 7.7 h (IQR 5.8–8.5 h/day). In the NIPPV + PR group, non-completers had a lower FEV1 (0.59 (0.17) vs 0.90 (0.38), p<0.05), lower vital capacity (2.20 (0.61) vs 2.89 (0.82), p<0.05) and higher residual volume as a percentage of TLC (69 (6)% vs 62 (8)%, p<0.05) than completers. In the PR group, three patients (9%) did not complete the study because of non-compliance. These patients had a higher total lung capacity (144 (3)% vs 122 (19)%) and residual volume (255 (10)% vs 220 (64)%) than the completers in this group (p<0.01). The number of rehabilitation sessions attended was similar between the groups: 39 (4) in the NIPPV + PR group vs 40 (4) sessions in the PR group (87% vs 89% of the prescribed sessions). In both groups the target peak workload as prescribed in the rehabilitation protocol (140% of the peak work load at baseline cycle ergometry) was achieved (NIPPV + PR: 140 (57–500)% in the NIPPV + PR group vs 140 (63–350)% in the PR group). Mean IPAP in the completers was 20 (4) cm H2O and mean expiratory airway pressure (EPAP) was 6 (2) cm H2O. The mean respiratory rate on NIPPV was 18 (3) breaths/min, inspiration time 0.9 (0.2) s, rise time 1.2 (0.6) s. Ventilator settings used in the drop-outs were not different (IPAP 18 (1) cm H2O and EPAP 5 (1) cm H2O). Most patients were ventilated through a full face mask (70%), the remaining through a nose mask. Mask choice was not different between the completers and non-completers. Using NIPPV, mean nocturnal Paco2 improved from 7.4 (1.1) kPa to 6.6 (0.7) kPa at the end of the inhospital institution. After 3 months the mean nocturnal Paco2 was 6.4 (0.6) kPa. Additional oxygen was titrated to achieve an oxygen saturation of ⩾90%. Mean nocturnal Pao2 remained unchanged. The difference in CRQ score change was not significantly different between groups (mean difference 7.5 points (ie, 0.5 points/question), 95% CI −1.0 to 16.0, p = 0.08, fig 2, table 5 in online supplement). The CRQ fatigue domain improved significantly more in the NIPPV + PR group than in the PR group. The MRF-28 total score and the MRF-28 cognition domain also improved significantly more with the addition of NIPPV. The NIPPV group improved on the SRI summary score as well as on five out of seven SRI subscales, whereas the PR group improved on none of the SRI domains. Changes in SRI scores were not different between the two groups. The HADS and MRC dyspnoea scale improved to a similar extent in both groups. 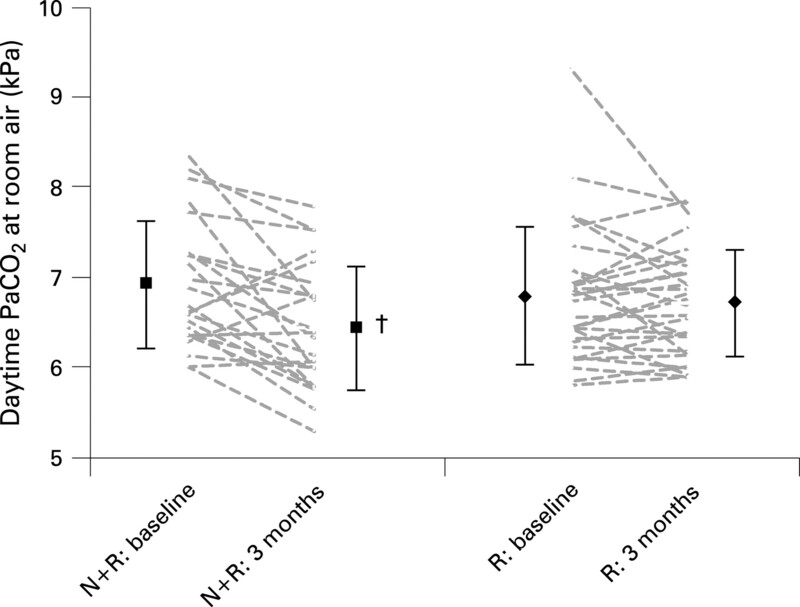 Figure 2 Mean (SE) changes in health-related quality of life scores after 3 months of treatment in the NIPPV + rehabilitation group (black bars) versus the rehabilitation group (white bars). The Chronic Respiratory Questionnaire (CRQ) contains the domains dyspnoea, fatigue, emotion and mastery; the Maugeri Respiratory Failure questionnaire (MRF-28) contains the domains daily activities (Daily), cognition (Cog), invalidity (Inv); the Severe Respiratory Insufficiency (SRI) questionnaire contains the domains respiratory complaints (RC), physical functioning (PF), attendant symptoms and sleep (AS), social relationships (SR), anxiety (AX), psychological well-being (WB) and social functioning (SF) summary score (SS). MCID, minimal clinically important difference. †Significant difference in change between groups (CRQ fatigue: mean difference in change between groups 3.3 points or 0.8 point/question, 95% CI 0.8 to 5.7; MRF-28 cognition mean difference in change between groups −22%, 95% CI −35 to −9; MRF-28 total score mean difference in change between groups −10%, 95% CI −18 to −1). After 3 months of treatment the Paco2 in the NIPPV + PR group improved significantly more than in the PR group (table 2, fig 3). The improvements in Pao2 and bicarbonate levels were not significantly different between the two groups. The change in Paco2 after 3 months correlated with the baseline Paco2 (r = 0.58, p<0.001) and with the number of hours of use of NIPPV/day (rho = 0.44, p = 0.04). Figure 3 Individual changes (dotted grey lines) and mean (SD) changes in arterial carbon dioxide tension (Paco2) in the non-invasive positive pressure ventilation (NIPPV) + rehabilitation group (N+R, left) and rehabilitation group (R, right) after 3 months of treatment. †Improvement in Paco2 in the NIPPV + rehabilitation group was significantly different from the change in the rehabilitation group. There was no significant difference between the groups in 6-minute walking test, endurance shuttle walking test and maximal oxygen uptake at peak cycle exercise performance change. However, the daily step count increased significantly more with NIPPV+ PR than with PR (table 3). Daytime resting minute ventilation improved significantly more with NIPPV + PR than with PR. The increased minute ventilation was attributable to an increase in tidal volume, as breathing frequency did not change. The NIPPV+ PR group improved in maximal inspiratory pressure, but the difference between the groups was not significant (table 4). The other lung function parameters remained unchanged in both groups. 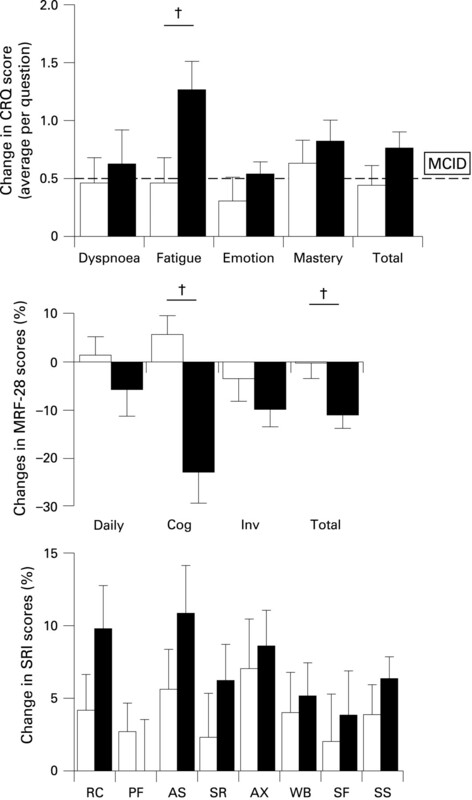 The results of this study show that, although nocturnal NIPPV in addition to pulmonary rehabilitation did not improve our primary outcome (the CRQ total score) compared with rehabilitation alone, it did improve the CRQ fatigue domain, the MRF-28 total and its cognition domain score, daytime Paco2 and daily activity level in patients with severe COPD with chronic hypercapnic respiratory failure. These improvements were accompanied by an increase in daytime resting minute ventilation. 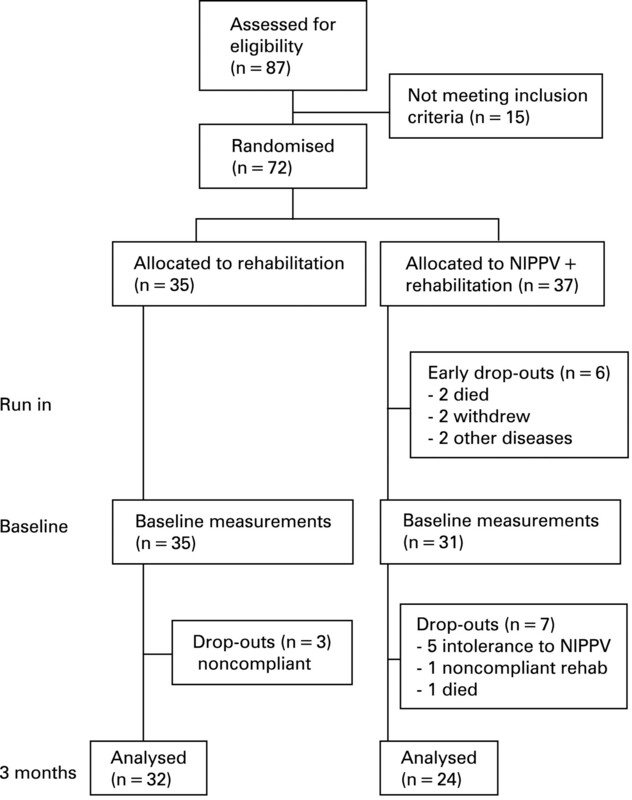 No significant improvements in pulmonary function, exercise testing, dyspnoea, anxiety and depression were found when NIPPV was added to pulmonary rehabilitation. We found an improvement in Paco2 in the NIPPV group, which is in contrast to the results of Garrod and colleagues who also studied the effect of adding NIPPV to PR.18 The lack of effect on blood gases in their study may be due to the low median NIPPV use of 2.08 h/day, the lower median IPAP value of 16 and the inclusion of patients with mild chronic respiratory failure (mean Paco2 6.0 kPa). Furthermore, the effects of NIPPV on arterial blood gases were not carefully monitored and no target was defined for improvement in blood gases under NIPPV. We adjusted ventilator settings based on nocturnal arterial blood gas measurements. On average, we used higher inspiratory pressures than have been used in previous randomised controlled trials. However, in our study there was no relationship between the height of the IPAP (r = −0.04) or the inspiratory pressure difference (IPAP−EPAP; r = 0.01) and the change in Paco2 after 3 months. This was consistent with our nocturnal readings where we noticed that, although a certain IPAP level is necessary to achieve effects, increasing the IPAP further does not always result in an improvement in blood gases. This emphasises the importance of careful and reliable monitoring during institution of NIPPV. Our patients were studied in hospital and were carefully monitored. Drop-out rates were acceptable compared with other studies13 15 and ventilator use was high. The fact that compliance is important is confirmed by the relationship found between the number of hours the NIPPV was used per night and the improvement in daytime gas exchange. In our study, on average the NIPPV group had a clinically relevant improvement of >0.5 points/item31 in all CRQ domains and the CRQ total score, while the PR group showed a clinically relevant improvement only on the mastery domain. We found associations that suggest a relationship between improvement in gas exchange and health-related quality of life (change in HCO3− vs change in both the SRI total score (r = 0.46; p = 0.001) and CRQ total score (r = −0.30; p = 0.03)32 and change in Paco2 vs change in MRF-28 cognition domain (r = 0.51; p = 0.01). In contrast to the exercise tests, unsupervised daily step count did improve significantly more with NIPPV + PR than with PR alone. An increase in daily step count has been reported previously, but in a mixed group of patients with chronic respiratory failure.33 The increase in daily step count did not correlate with change in Paco2, nor did it correlate with change in breathlessness scores, formal exercise test scores or activity domains of the quality of life questionnaires. This reflects the fact that the pedometer provides a reflection of daily submaximal activity not measured with exercise tests or questionnaires, but especially clinically relevant for the individual patient. Step count is probably an extension of endurance capacity. Furthermore, change in ESWT tended to improve with NIPPV but did not reach statistical significance because of the large spread in outcome. The present study has some limitations. We did not use sham ventilation in our control group, so patients and investigators were not blinded to the therapy. We believe sham ventilation is difficult to implement at home during the long period of this study. Second, we only included 72 patients while the power calculation had provided that 40 versus 40 patients were needed to achieve a 10-point change in CRQ total score. However, recruitment was tedious and, because of financial constraints, we were unable to further extend the inclusion period. This might have influenced our results due to a type II error for false negative outcomes. Effects that were already significant in our study with lower numbers of patients, however, remain valid (type I error unchanged set at 0.05). In contrast to the CRQ, the MRF-28 and SRI were developed especially for patients with chronic respiratory failure and contain items on problems experienced by patients with chronic respiratory failure. Both new questionnaires proved to be reliable, valid34 and more responsive in this patient group.35 The power of them might therefore have been more appropriate. However, when the study was designed there was little experience with this questionnaire. Finally, we presented a fairly large number of outcomes. From a statistical point of view, presenting many outcomes would increase the chance of finding positive outcomes. However, omitting these important outcomes would raise questions about how they change with the addition of NIPPV. Furthermore, as expected outcomes (such as the different subscales of health-related quality of life) all changed in the same positive direction, we believe that these outcomes are in fact true. In conclusion, non-invasive ventilation augments the benefits of pulmonary rehabilitation in patients with COPD with chronic hypercapnic respiratory failure as it improves several measures of health-related quality of life, functional status and gas exchange. We found that NIPPV acceptance rates were high, as was the median number of hours of use when careful assistance and monitoring were applied.
. Definition, epidemiology, and risk factors. BMJ 2006;332:1142–4.
. Predictors of survival in patients receiving domiciliary oxygen therapy or mechanical ventilation. Chest 1996;109:741–9.
. Randomized controlled trial of pulmonary rehabilitation in severe chronic obstructive pulmonary disease patients stratified with the MRC dyspnea scale. Eur Respir J 1998;12:363–9.
. Physiologic evaluation of 4 weeks of nocturnal nasal positive pressure ventilation in stable hypercapnic patients with chronic obstructive pulmonary disease. Respiration 2001;68:573–83.
. Respiratory muscle rest using nasal BiPAP ventilation in patients with stable severe COPD. Chest 1994;105:1053–60.
. Hypoxaemia enhances peripheral muscle oxidative stress in chronic obstructive pulmonary disease. Thorax 2005;60:834–41.
. Domiciliary nocturnal nasal intermittent positive pressure ventilation in COPD: mechanisms underlying changes in arterial blood gas tensions. Eur Respir J 1991;4:1044–52.
. Exercise endurance before and after long-term noninvasive ventilation in patients with chronic respiratory failure. Respiration 2008;75:296–303.
. Randomized controlled trial of domiciliary non-invasive positive pressure ventilation and physical training in severe chronic obstructive pulmonary disease. Am J Respir Crit Care Med 2000;162:1335–41.
. Systematic review of noninvasive positive pressure ventilation in severe stable COPD. Eur Respir J 2007:30:293–306.
. Controlled trial of external negative pressure ventilation in patients with severe chronic airflow obstruction. Am Rev Respir Dis 1989;140:1251–6.
. Global strategy for the diagnosis, management, and prevention of chronic obstructive pulmonary disease: NHLBI/WHO Workshop. Executive summary. Bethesda, MD: NHLBI, 2005.
. Clinical trials: a practical approach. Chichester, UK: John Wiley, 1983:84–7.
. Analysis of factors that characterise health impairment in patients with chronic respiratory failure. Eur Respir J 1999;13:1293–300.
. The Severe Respiratory Insufficiency (SRI) Questionnaire: a specific measure of health-related quality of life in patients receiving home mechanical ventilation. J Epidemiol 2003;56:752–9.
. The measurement of dyspnea: contents, interobserver agreement and physiological correlates of two new clinical indexes. Chest 1984;85:751–8.
. The significance of respiratory symptoms and the diagnosis of chronic bronchitis in a working population. BMJ 1959;1:257–66.
. Pedometer measures of free-living physical activity: comparison of 13 models. Med Sci Sports Exerc 2004;36:331–5.
. Evaluation of a movement detector to measure daily activity level in patients with chronic lung disease. Eur Respir J 1997;10:2814–9.
. Health-related quality of life in COPD patients with chronic respiratory failure. Eur Respir J 2008;32:379–86.
. Efficacy of pulmonary rehabilitation in chronic respiratory failure (CRF) due to chronic obstructive pulmonary disease (COPD): the Maugeri Study. Respir Med 2007;101:2447–53. Funding: This study was funded by the Dutch Asthma Foundation. Ethics approval: The study was approved by the local medical ethical committee and all participants gave written informed consent to participate. Thorax 2008; 63 i-i Published Online First: 19 Nov 2008.